It was 1984 where Mumbai was worst hit by the eruption of communal violence. Govandi, a north-eastern suburb of Mumbai was also witness to vastly communally hostile climate straying into worst law and order situation creating an enormous risk to the minorities. In the wake of the dominating communal conflict in Govandi and its adjacent, the Central Minister Zia ur Rehman Ansari visited Govandi and it’s adjacent. The people of that area had a chance to interact with the Union Minister who expressed all round suspicion over the allegedly partisan role of the police explaining their constant fear of being attacked by the communalists. In the discourse, the entire police force was not blamed. The Muslims fairly struggled to draw the attention of the Union Minister for the immediate intervention of the army. The persistent and insistent demand for the intervention of the army to normalise the situation drew some irritation from the Union Minister who promised to introduce the army in the messy situation. The army thus was brought into the picture. The socially detached brave soldiers lost no time in countering the aggressive communal forces. The Muslims of that north-eastern suburb of Mumbai and its adjacent had a high degree of praise for the bravery, selflessness, impartiality and secular character of the soldiers who played a vital role in saving the helpless minority. Again the impartial role of the army in the subsequent events of the worst ever communal violence in Mumbai in 1993 in the wake of the Babri Masjid demolition also drew a lot of applause. The deteriorating law and order situation continued unabated with the allegedly partisan role of the police. In contrast, the army did a good job and kept the communal forces under control. It is the questionable style of functioning of a certain section of police communally entrenched which poses a challenge to the law and order problem as far as Muslims are concerned. However, in the messy imbroglio, there are good cops whose continued efforts are directed to see that the peace and tranquillity gather momentum. The intensity of the desire to maintain law and order at any cost and isolate the incendiary climate can well be illustrated in the words of the Additional Police Commissioner Shelar in Kalyan in Maharashtra state while participating in some religious festivity of Abdul baba who expressed the pleasure that Hindus and Muslims have come together to that celebrated event. However keeping aside the sensible approach of a certain section of the police the fact remains that the army has delivered and effectively tackled many a crisis like situation. However, notwithstanding the fact that certain forces are out to consolidate the secular credentials with their impartial performance it is unfortunate to note that present political dispensation is trying every trick in the book to communalize every component of the government invoking the jingoistic interpretation of nationalism and with the creation of the deepening communal divide. In the chain of events, how can the army remain isolated from the communalization efforts. The entire exercise of creating the communal divide by whipping up the pseudo-nationalism is with an eye on the impending U.P. Punjab or election in some other parts. The case in point is the politicisation of surgical strike against Pakistan and the person capitalising on the whole issue is no less than the Defence Minister Manohar Parrikar. 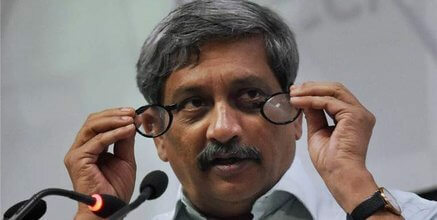 Manohar Parrikar has no compunction in dragging the military surgical strike applauded across the socio-political spectrum into a messy domestic political imbroglio. Parrikar focusing on the sharp military response to Pakistan through the surgical strike gave credit to RSS for the decision to launch Cross LOC surgical strike. It is the Indian army which deserves credit for fighting Pakistan and how the RSS has come into the picture. RSS is an extremist organisation which has attracted the allegations of killing Mahatma Gandhi. The very ideology of RSS is based on uniformity of the nation where the different religious or cultural identities are to be submerged. It desires all the diverse religious cultural identities to be straight-jacketed in a monolith which is in conflict with the concept of pluralistic society. The idea of Uniform Civil Code is an effort in killing the very spirit of unity in diversity. The uniform civil code the brain child of RSS is hugely resisted by the Muslim. Falling in line the Muslim advocates led by Adv Faisal Kazi had a meeting in Kalyan which opposed the move of the government to interfere with the fundamental rights of the Muslims to go by the Shariat laws. The meeting was graced by the Adv Zubair Kazi, Adv Farooque Nizami, Adv. Kashif Shaikh, Adv. Ammar Saad Kazi, Adv. Umar Kazi, Adv. Awais Juwari and others. An army has the secular ethos and any effort to distract it from the same is not called for. Manohar Parrikar conveniently forgot that Ms Indira Gandhi who broke Pakistan was intensity anti RSS who drew strength from secular values having four Muslim Chief Ministers like A.R. Antulary, Anwara Temur, Barkatullah khan and Abdul Gafoor. Indira’s action suggested that diverse secular India is always powerful than communal India. As this was not enough Modi went a step further comparing the surgical strike with the Israeli defence forces operations. Any mention of Israeli forces being capable of carrying out military reprisals is to give an iota of justification to the massive criminal acts of Zionist State against the helpless, poor and unarmed Palestinians who are fighting for their land usurped by the Israelis. It is no less than rubbing salt in the wounds of Muslims all over. Coming to the genesis of Israel it is relevant to note that in 1947 the British government issued the Belfour declaration which declared British support for the creation in Palestine of a “national home for the Jewish people”. The declaration enthusiastically received by many Jews worldwide, but was opposed by Palestinian and Arab leaders, who later claimed that the objective was a breach of the promise made to Sharif of Mecca in 1915, in exchange for Arab help fighting the Ottoman Empire during World War I. It was the holocaust of Jews at the hands of Nazi Germany which gave a boost to the Jewish nationalism triggering massive migration of the Jews to the Jewish homeland in Palestine. Falling in line the Jews from Mumbai very much settled in the predominantly Muslim areas like Umar Khadi and Nagpada also migrated to Israel. The relations between Jews and Muslims remained very cordial and harmonious. Worth it is to note that a Jew principal Ms Sampson did a yeoman’s job in raising the standard of Anjuman Islam Girls High School, Belasis road, Mumbai. Ms Sampson occupied quite a significant space in Muslim social life at that point in time than the Muslim principals. It is the thrust of migrants from Mumbai or anywhere else in the world which triggered the surge in the Jewish demography in Israel. The Israeli administration creating the new Jewish settlement of the immigrants emboldened with the U.S. backing went unrestrained in frightening, terrorising and victimising the poor, helpless and unarmed Palestinian who are fighting for justice with the usurpation of their lands and misappropriation of their rights. Any reference to Israeli operation against Palestinians in the context of a surgical strike is to justify the state sponsored terror of Israel smelling irrational communal approach. Our army is a professionally capable fighting force which has witnessed the rise in its image at domestic or external front. The political class is only a talking shop with the declining credibility which needs restraint in its misplaced assertions.